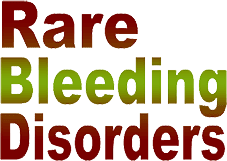 The Rare Coagulation Disorders Resource Room, an extension of the RBDD Registry (http://www.rbdd.org/), was developed in collaboration with the Indiana Hemophilia & Thrombosis Center (www.ihtc.org), and the Rare Coagulation Disorders Subcommittee of the National Hemophilia Foundation (NHF), a group appointed by NHF’s Medical and Scientific Advisory Council. The Resource Room serves as a platform for promoting international collaboration to increase knowledge of these very rare disorders and to improve the care of affected individuals. The international RBDD mission, under the leadership of Dr. Peyvandi, will continue to be expanded over time. The Resource Room thanks the Rare Coagulation Disorders Subcommittee and the authors of the website articles for making this valuable information available to the global community of both individuals affected with rare coagulation disorders and their health care providers. Copyright © 2014 RareCoagulationDisorders.org. All Rights Reserved.